I have been a little slack at posting in the blog this past week or so as I have been doing a little commission for a Tennant Coat for a guy in Australia. He had been thinking about commissioning me for a while, then decided to take the plunge. I delivered it this week and he is pretty happy with the result, and wrote the following review about his coat. It has to be said from the outset that this is a pricey endeavour for anyone. I don’t know what you do for a living, but I certainly don’t have six hundred quid just lying around for a rainy day. Having said that, however, Steve does offer a payment plan which anaesthetises the pain a little, if prolonging the agonizing wait. Also, there is no fine print or hidden extras, no surcharge for the brownness of the coat or the roundness of the buttons, it’s all up front, BS-free. The number he gives you at the start is the same number at the end. I’d suggest that if you’re just looking for something long and brown and vaguely Tennant-shaped, and aren’t particularly interested in screen accuracy or overly obsessed with quality, then investigate one of the several online options that are available. That’s what I did, originally. If you do that, however, only your wallet will thank you, and you’ll be back. Oh yes, you’ll be back. Rest assured, you are buying something for your money. Go into the other room and get out one of your Doctor Who DVD’s, one which stars David Tennant. Pop it in. See that coat he’s wearing? In terms of screen accuracy and workmanship, the coat is difficult to fault. The fabric and buttons have been painstakingly sought to be as close a match as possible to the real thing. Neither the outer material or the lining are exactly as they appear on screen, but these fabrics are both discontinued, and anyway, the original fabric cost even more than this, so don’t worry about that. Steve has scoured the globe and located a lining which, again, is as near as is humanly possible to the onscreen coat. The internal breast pockets have also been lavished with the sort of obsessive attention to detail only a fan is capable of; the pocket’s trim is the same orange as the real deal, and even the inside back panel of the pocket has been matched to the slightly darker material of the original. Who the hell’s going to see that anyway? You will. The pleat which runs down the back of the coat, along with those little triangles at either end of it, are exactly as you’ve seen them, and every other seam on the outside of this thing, even ones you never even noticed or cared about, are there. Some are even top-stitched, again, just like the real one. That’s right, even the stitching is the same. Believe me, I’ve ploughed through a DVD or two myself checking all this. The side pockets on the original coat are a bit odd. The pocket itself is placed a little below the actual flap which covers it, a unique design which isn’t common to your everyday suit or overcoat. And guess what? Steve’s on top of that too. The guy mustn’t have much of a life going on. The material itself is a type of suede, but it’s a tough suede, a suede you’re not afraid to knock around and crease and spill stuff on and punch on at the pub in. It’s durable, and, I’m assured, resiliant to the elements. 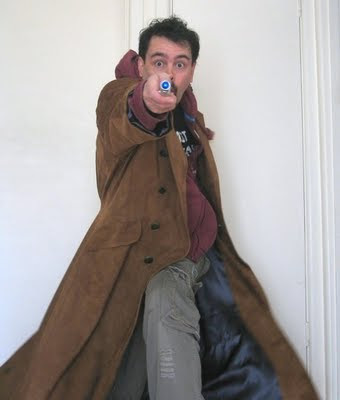 This coat has been my second skin since I bought it, and, like the Doctor, I tend to fight a few monsters here and there. On the negative side, apart from the fact your Mum has to go on the game for six weeks to cover the cost ... well, there’s very little to complain about. There are a few tell-tale pinholes around the pockets and the lining, which I assume is a necessary evil of the coat-making process. These are especially prevalent in the orange rims of the inner pockets. And I would strongly suggest that when supplying Steve with your measurements, you measure very, VERY carefully. Then measure again. I made a small error which resulted in the coat being around two inches too short. Granted, it’s not something anyone will ever notice except me, but when you’re going to this expense and this trouble to have something as accurate as this created, it’s a shame to allow your mathematical ineptitude cause even the slightest disappointment. I must stress though, that this was entirely my own fault, and Steve was following my directions with his usual meticulous accuracy. 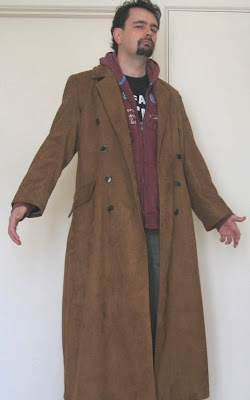 I’ve spent some time since I recieved the coat comparing it not only to David Tennant’s onscreen costume, but also against the best of the other replica options out there. This coat is second to none. To NONE. I should touch on Steve’s customer service. In my case, I am blessed with an irrational and crippling paranoia, especially when it comes to parting with wads of cash when there isn’t a door I can go and pound upon should matters become askew. From the beginning however, Steve was prompt, courteous and professional in response to my queries. Once I had commissioned him, he sent updates every few days, sometimes containing photographs, detailing the work he had done that day, and outlining the work he planned to do the next. He was professional, good-humoured, and, above all, above board! The parcel was trackable all the way around the planet to my kitchen table, and Steve was emailing me to find out whether I was happy with the coat almost before I’d even opened the box! The bottom line is, if you can possibly spare the cash, and you are agonizing over whether or not to bite the bullet, agonize no more. If you are serious about screen accuracy, attention to detail, and professional tailor standard quality, this is the route for you. I guarantee you you will NOT be disappointed. Expensive? Sure. Worth it? Absolutely. Take it from me, hand on hearts. You can trust me, I’m the last of the Time Lords. I’ve got the coat to prove it. Wow - I am blushing! Thanks Ian. That is the sort of comments that make doing a coat worthwhile. And I just love the mash-up way of wearing it with casual clothes. I've actually commissioned Steve to make me another!! The hem length really bothered me that much. 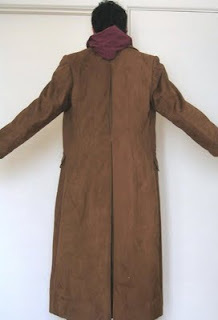 So the above coat will go and live somewhere else in due course while I impatiently await my new one. I had no hesitation or qualms whatsoever in commissioning Steve again, that in itself is a testament to the quality of his work. since your commissioning a new one will you be selling your current one if so I would be interested in buying it from you.